The Province of Maguindanao is all set to celebrate the first-ever Inaul Festival this coming February 9-14, 2017. 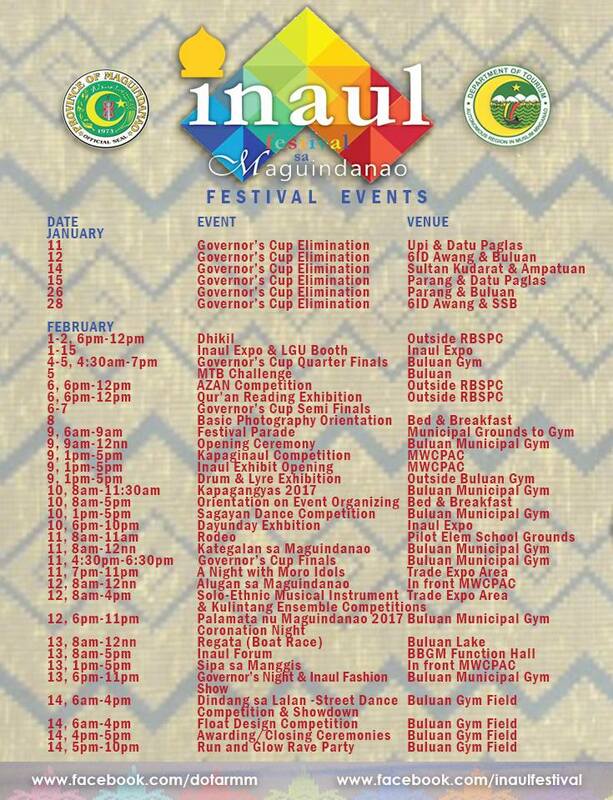 To be held in the Municipality of Buluan, which is now the capital of Maguindanao, the week-long celebration will feature the hand-woven Inaul fabric, one of the well-known and unique symbols of Maguindanaon culture. Among the highlights of Inaul Festival in Maguindanao will be the Inaul Weaving Competition or Kapag Inaul in Maguindanao dialect. The activity will showcase the weaving skills and techniques of the Maguindanao women. The Sagayan Dance Competition is also a must-see event during the Inaul festival. Sagayan is Maguindanao war dance that is a colorful and festive reminder of the greatness of the people of Muslim Mindanao. Other activities to watch out that will showcase the rich culture and traditions of Maguindanao are the street dancing competition, rodeo, regata or the boat race, and many more. Be there. See the schedule of activities below. Preparations are now in full swing in Buluan, Maguindanao for the first Inaul Festival. Check out the following photos below.